Early bird bookings have just opened for Europe’s top conference for the timeshare industry, the #RDO7 conference that will take place from 20 to 22 September at the Pestana Chelsea Bridge Hotel & Spa, London. Grab your tickets today! 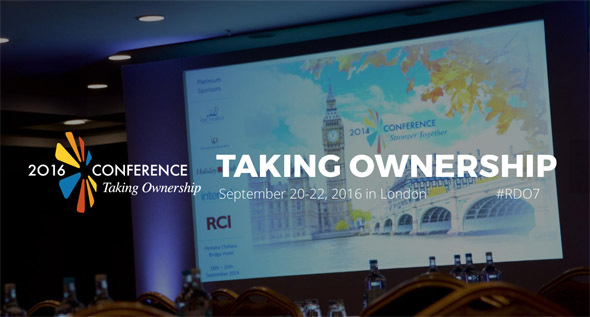 This year’s theme is ‘Taking ownership’ and the conference will focus on the need for all interested parties take control, highlight positive experiences and team up to promote timeshare. We look forward to hearing your input and ideas, coming up with new initiatives and finding ways to work together for the benefit of the industry. Visit the RDO7 conference website to find out more and reserve your seats. Don’t leave it! The early bird rates end at midnight on July 1, 2016. RDO members benefit from special discounts, as do companies that have sent delegates to recent conferences. Please see the website for full details and rates.